Work Package 2 covers the selection and on-farm implementation of PLF systems to collect data on the animal in the domains animal welfare and health, environmental load and productivity. 2.1 Select implementable systems (PLF-systems) to measure animal responses that relate to Key Indicators. Animal scientists, PLF researchers and technology providers in the market will define together the most relevant sensors and sensing systems to measure the animal Key Indicators selected in WP1. 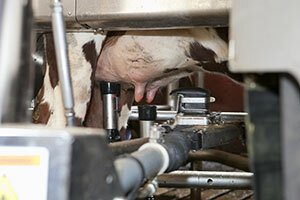 2.2 Make the selected PLF-systems operational on dairy, pig and poultry test farms. To demonstrate the potential of PLF systems on farm, the selected PLF-technologies will be implemented on a number of farms. On each farm, treatment groups (equipped with PLF systems) and control groups (not equipped with PLF systems) will be established throughout at least half of the investigation cycles. In each farm, dependent on the species, a number of selected KIs, representing at least one of the domains welfare and health, environmental load and productivity will be monitored by the implementable system that is made operational. 2.3 Collect data during extensive field tests on dairy, pig and poultry farms. The companies providing the PLF systems are responsible for the data collection and the maintenance of the system during the trial period. A quality check of the data will be made by the companies in close collaboration with the scientists processing the data in WP3.